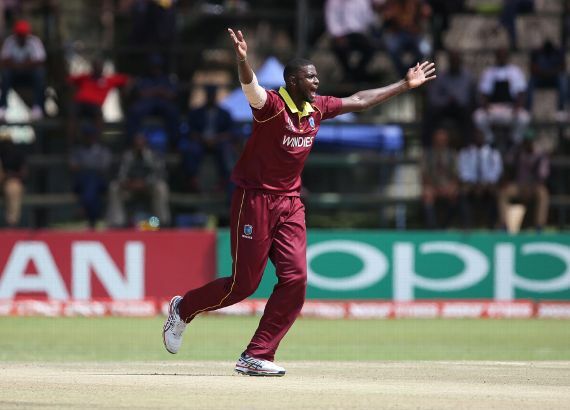 HARARE: The West Indies snatched a spot at next year´s World Cup by edging to a five-run victory over Scotland on DLS method in Harare on Wednesday. The two-time World Cup winners were bowled out for just 198 batting first, but rain forced an early finish with the game in the balance and Scotland on 125-5 with 14.4 overs remaining. Jason Holder´s Windies claimed the penultimate place for the tournament in England and Wales, with Scotland knocked out of contention. With no reserve days in the crucial qualifying tournament, Scotland were left agonisingly short of a massive upset. A controversial lbw decision also proved key as Richie Berrington fell to Windies spinner Ashley Nurse for 33, with no DRS in place for the qualifiers. Had the rain come with Scotland on the same score but four wickets down, they would have qualified instead. Earlier, the underdogs had a dream start to the winner-takes-all clash, with Safyaan Sharif dismissing star West Indies opener Chris Gayle with the first ball of the match. Sharif and Bradley Wheal each finished with three wickets, as Scotland restricted their opponents to under 200 despite 66 from Evin Lewis and a gritty half-century by Marlon Samuels. The Scots rebuilt after being reduced to 25-3 as Kemar Roach claimed two early wickets, but were left high and dry by Berrington´s dismissal and the rain. Zimbabwe will claim the final place at the reduced 10-team World Cup if they beat the United Arab Emirates on Thursday. #good luck #scotland for future.. they play well throughout the the #WC Qual_.